Summary Four-bay RAID5 class NAS with dual Gigabit Ethernet ports. Powered by dual-core Annapurna Labs CPU. We recently looked at three entry-level NASes from Synology, the two-bay DS216j and four-bay DS416 and DS416j. So we figured we should give QNAP the same opportunity and asked them for their least expensive two and four bay options. The TS-431P was their choice for four-bay and the TS-228, which I'll review next, was their dual-bay pick. 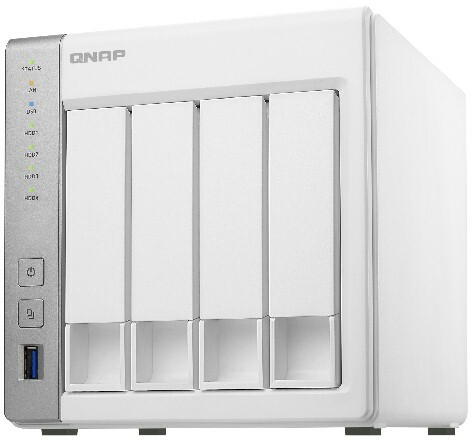 QNAP's entry-level four-bays are currently the TS-431, TS-431+, and TS-431P. The chart below shows the major differences between the three with the specification differences highlighted. Both the TS-431P and TS-431+ are powered by an Annapurna Labs Alpine AL-212 dual core processor, but the TS-431P is clocked slightly faster. Both of these NASes support jumbo frames and have 1 GB of RAM, compared to the 512 MB in the TS-431. The TS-431 does not support jumbo frames but does have an eSATA port. All three have three USB 3.0 ports and hot swappable HDD trays. The TS-431 is slightly more power hungry than the other two, but all three have very low noise ratings. The reason QNAP sent the TS-431P is that they'll soon be discontinuing the other two TS-431s. Given the spec and price similarities, that's probably a good move. This review will compare the performance of the TS-431P with the recently reviewed Synology DS416 Disk Station. That review also included the Synology DS416j, a somewhat less-expensive Marvell-based 4-bay NAS. I chose the DS416 Disk Station for comparison because the processor and memory are very similar to those in the QNAP TS-431P. The chart below, generated from our NAS Finder, compares the major features of the TS-431P and DS416. You can see the full feature comparison here. Though both NASes use the same Annapurna Labs CPU, the major difference is that the TS-431P's CPU is clocked at 1.7GHz - slightly faster than the 1.4 GHz clock speed used in the DS-416. We'll see if that translates into a performance edge later. The callouts below show the front and rear panel of the TS-431P. The front panel has a single USB 3.0 port and a One Touch Copy button that lets you easily copy files to/from a flash drive. Located just above the copy button is the Power switch - not specifically called out. The rear panel has a reset button and dual Gigabit Ethernet ports that support link aggregation, fail over and load balancing. There are two additional USB 3.0 ports for external storage or printers. Missing on the TS-431P is the HDMI port that is found on more powerful QNAP products. The chart below shows the description of the LED color and flash sequences used by the TS-431P. Note: This is a generic chart that applies to all models, so there might be some variation from product to product. It was fairly easy to disassemble the case to get at the circuit board. Four screws secured the case and approximately eight screws secured the HDD cage. The image below shows the component side of the main board. The Annapurna CPU is covered by the heatsink. The connector near the fan is for the drive backplane. The Table below shows the key component summary for the QNAP TS-431P and the Synology DS416. The TS-431P drew 24 W with four of our stock WD Red 1 TB (WD10EFRX) spun up and 10 W in power save mode with the drives spun down. Fan and drive noise was rated low (mostly drive noise). RAID 5 and RAID 10 build time was ~ 3.5 hours. QNAP NASes share a common operating system, whose latest version is QTS 4.3. You can read or download a comprehensive brochure here. QTS 4.3 continues QTS 4.2.2's look and feel with some minor visual tweaks. You still can't resize many of the windows, whose default width is more than 1024px. The screenshot below shows the "hamburger" menu and dashboard flyouts exposed. Of course, some of the features found in the high performance NASes, such as real-time 4K video transcoding and virtualization won't be available on entry-level NASes such as the TS-431 series. But Plex is among the installable apps, all of which are shown below, along with all QNAP's "Station" apps. A noteable omission is antivirus, however. Complete specifications for the TS-431P can be found here. QNAP has a YouTube channel that hosts the QNAP College. There are videos covering hardware installation, initialization, setting up myQNAPcloud, Network Access protection and a tutorial on how to backup your Mac. There is a total of 29 Videos that provide support on a wide range of topics. Firmware version 4.2.3 was loaded onto the TS-431P and performance tests were run using the Revision 5 NAS test process. All tests were run using Western Digital Red 1 TB WD10EFRX (x4 SNB supplied). The benchmark summary below compares the QNAP TS-431P and the Synology DS416. File copy Write and File Copy Read results were consistent across all RAID levels (RAID 0, 5, & 10) for both NASes. All results were close to 110 MB/s and approached the theoretical limit of single client testing on a single Gigabit connection. Similarly, the NASPT File Copy to NAS and NASPT File Copy from NAS scores were all within about 5% of each other for both NASes for all RAID levels. Several sets of tests results stood out. For RAID 0, the TS-431P was almost 17% faster on the NASPT Directory Copy to NAS than the DS416. However, the TS-431P was 40% slower on the NASPT Directory Copy from NAS and 58% slower on the NASPT Content creation. Similarly, the TS-431P was almost 26% faster than the DS416 for NASPT RAID 5 Directory Copy from NAS and about 23% faster for the RAID 10 results on the NASPT Directory Copy to NAS. For the USB 3.0 backup tests, the DS416 edged out the TP-431P on two of the three file systems tested (EXT3 and NTFS). The DS416 was quite a bit faster on the network backup tests turning in 58MB/s as compared to the 36.6 MB/s on the TS-431P. iSCSI read and write results on the two NASes were within 5% of each other. To quickly highlight the major differences, I pulled the benchmark results for the two products into an Excel spreadsheet so that I could calculate the percent differences in performance compared to the TS-431P. A negative percentage means that the QNAP TS-431P is slower than the Synology DS416. The chart below shows the Total NAS Ranker scores for the eight least expensive four-bay NASes. The QNAP TS-431P has a Total NAS ranking of #9 as compared to the #5 ranking for the Synology DS416. Looking at the subcategories, the QNAP TS-431P had category wins for both the Write Benchmarks as well as Read Benchmarks. The relatively poor results for RAID 0 NASPT Content creation dragged the overall category ranking for Mixed Read Write to #9. It's worth noting, however, that the RAID 5 and RAID 10 NASPT Content Creation results were only 4% -5% lower than those of the DS416. Not surprisingly, the Backup category ranking for the TS-431P was dragged down by the relatively slow network backup results. Other categories, as you can see, were very close for many of the tests with the TS-431P often holding a slight edge. It's rare to see two competing NASes that turn in so many results within our 5% tolerance for rankings. For all the major file copy read and file copy write tests, the results were nearly identical. So in practical terms, you probably wouldn't notice a difference in performance between the QNAP TS-431P and the Synology DS416. Looking at the NAS Ranker, it would seem that the cheaper, #8 ranked Synology DS416j might be a better value. But both of the compared NASes in this review have dual Gigabit Ethernet ports, tool-less disk trays, and hot swappable drives - all of which are missing in the DS416j. And both have significantly faster processors that could yield even more performance in a link-aggregated configuration. In the end,either one of these NASes would be a good choice for the Home/SOHO environment. You can save a few dollars by buying the TS-431P, but ultimately, your decision may come down to whether you prefer the features offered by QNAP's QTS or Synology's DSM operating systems.